Rebel Against Hard Work in your Living Room..
Click a hammock to learn more, and to purchase. All models are the same size – only styles vary. If you’ve come to this page searching for the best hammock money can buy congratulations! You’ve found them. Whether you’re looking for the perfect backyard hammock, indoor hammock, or even a bed hammock to sleep in, there are a few basic things you want to look for. Hammocks come in many forms; fabric hammocks, rope hammocks, all-weather nylon or synthetic hammocks, woven cotton hammocks, and so forth. They all have their different uses. Some are lighter weight for camping, others waterproof, and others resist fading or rain better. But unless you bought it for a jungle expedition or a climb up Everest, your first priority should be comfort. 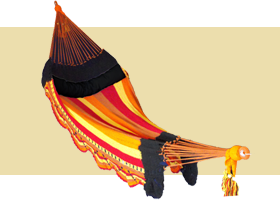 Lazy Bandido hammocks use the best cottons and a perfected double-spring weave that gives them the optimum flex, softness, and ability to breathe. Once you’re in you won’t want to leave. You sleep in your bed every night. You can take a nap on the couch. But there’s something exotic about lying in a backyard hammock. There’s a sense of adventure to it, a mystique. It’s an exploration into other cultures, and it’s a sort of mini-rebellion against the daily slog of work and sacrifice. So don’t waste your hard-earned money on a boring rope hammock. Make a statement! Choose the right colors and you can move that backyard hammock to the patio, living room, or even bedroom. Use it as an extension of your house; an integral part of the décor. The best hammocks should make a bold style statement wherever you hang them. There’s a lot of talk about all-weather backyard hammocks; weather resistant, mildew resistant, windproof, waterproof, etc. Do you plan on napping in a hurricane? No. So don’t sacrifice comfort for a gale proof tarp shaped like a hammock. Just take it down and store it at night. Problem solved.